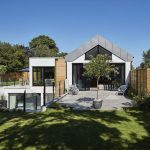 Cath Hassell from ech2o consultants talks us through the options available when planning drainage for your self-build. Drainage is not something usually learnt by architects during their studies. Large architect firms typically employ drainage engineers. 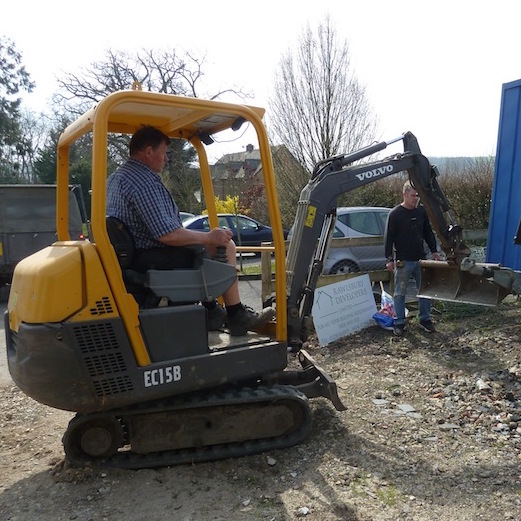 On a job with a smaller budget, the builders deal with drainage as they have the know-how. Cath explains that taking sewage away from the house is essentially a simple process, covered by Building Regulations. Lay a pipe in a trench (at a one in 40 drop) up to your site boundary, and backfill. The local water authority will then make the final connection. Builders tend to prefer using uPVC for the pipe. However uPVC pipe has to be laid in gravel, displacing earth that may need to be removed from site. So Cath always specifies clay pipe, which can simply be backfilled with site earth, and has plastic connectors for ease of use. According to Cath, the Environment Agency are now saying if you’re near to mains drainage, you have to use it for your new build. There are few areas where the sewage systems are overloaded; issues only happen during rain events. That said, it’s important to minimise what has to be taken away as it takes energy to pump along the sewer system and treat. The first step is to contact your local council or Building Control department to find out whether you’ve got separate sewers that take 1) foul and waste water, and 2) rain water, or combined sewers where they’re mixed together. If possible, you want to keep rainwater out of combined sewers. And even if you have separate sewers, Cath recommends dealing with rainwater onsite. One way is to harvest rainwater, as Cath has explained in a previous podcast. 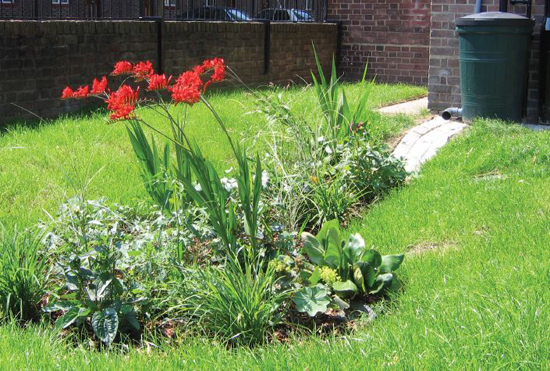 She also mentions SuDS (sustainable drainage systems) for managing surface water. Where mains sewers aren’t available, cesspools have been used to capture waste to be processed elsewhere. 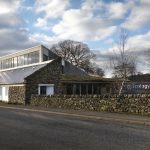 While they ensure it doesn’t go into the ground or water, Cath says that environmentally it’s a really bad idea and it’s very costly anyway, explaining, “You’ve got to pay somebody to come in, pump it out and then take it to a sewage treatment plant and pump it into the plant.” Her advice is to deal with it onsite. Unless you’re on a site in a dry part of the UK and solely reliant on rainwater, Cath wouldn’t bother with composting toilets. They take up space and many are in fact dehydrating toilets that require electricity to dry out the poo. She points out that some people fixate on composting toilets but don’t even compost their vegetable waste! However, if you’re building a workshop / cabin / sleepover place in the garden, there are some simple compost toilets available and preferable to a chemical toilet. Cath likes the look of this product. Septic tanks have been a popular option for 800,000 properties in the UK not on mains drainage. What a septic tank does is settle out the solids to be broken down by anaerobic bacteria. Some of the solids sink to the bottom, and some float to the top forming a crust. Historically, the resultant effluent left the tank to be treated via a ditch, stream, soakaway or drainage field. A lot of those systems failed, and an EU Groundwater Directive was passed in 2006 to prevent further contamination. On 1st January 2015, the UK finally changed their regulations and Cath explains why you can no longer use a septic tank if you want to go into a stream or surface water. “The bacteria will go ‘wayhey, poo, brilliant’, they’ll start eating it, they’ll start to multiply.” This takes the oxygen from the water, which means that there’s less for fish and plants. And because you’re putting in a whole pile of nutrients, you’ll also get nitrification and algal blooming. So now you have to use what’s called a package sewage treatment plant. 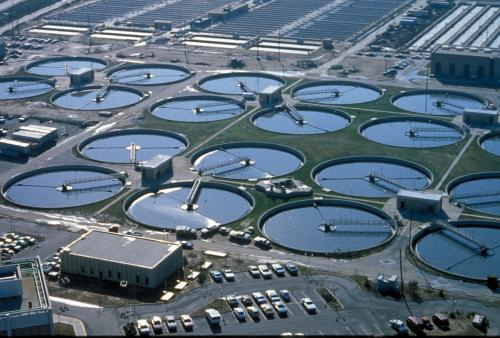 Package sewage treatment plants use aerobic bacteria to more effectively break down the waste. 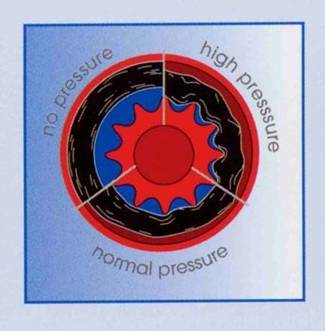 This requires introducing air into the system, normally using a pump. Or in the case of a Biodisc – a make of package sewage treatment plant – by use of a rotating disc inside. Without air the aerobic bacteria will die, so these systems have to be run continuously even if you don’t live onsite full time. 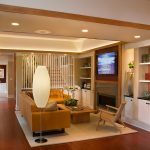 The electrical cost may therefore be a consideration. But unlike septic tanks, these systems provide certainty that you will not be putting nutrients into the water or your drainage field. A drainage field is a series of slotted pipes in a herringbone pattern laid across the land so that the effluent from a septic tank or package sewage treatment plant will percolate down through the ground. 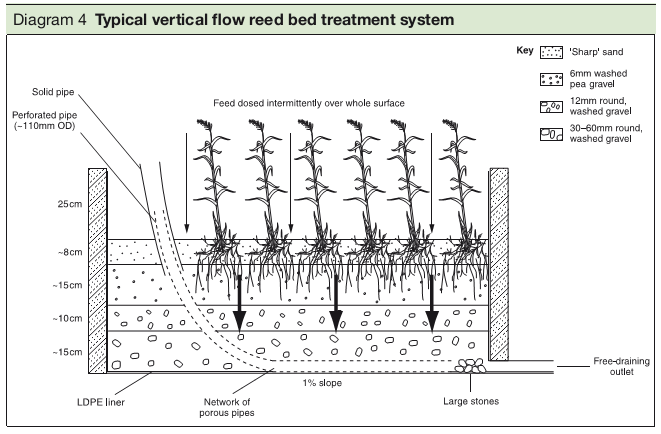 You can get horizontal flow or vertical flow reed beds. 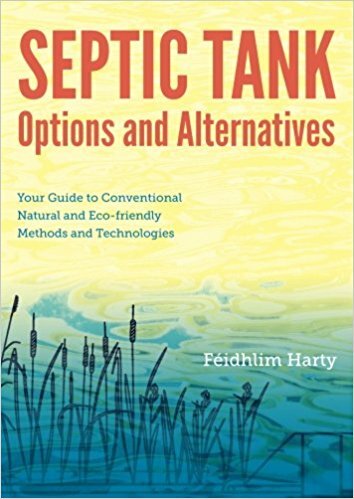 Sometimes they’re called constructed wetlands, although this term can mean different things as explained in Septic Tank Options and Alternatives by Feidhlim Harty (written for Ireland, but relevant to the UK). 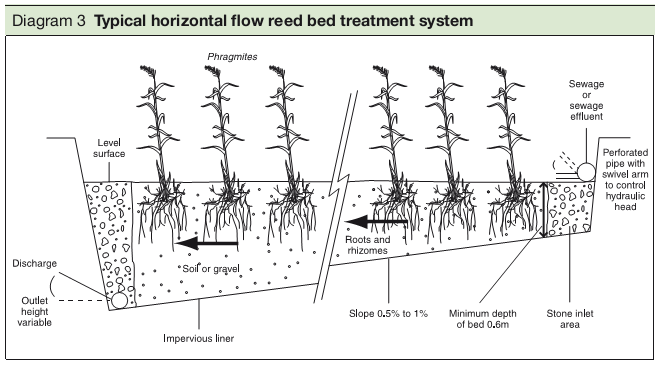 Reed beds are sometimes seen as environmentally better options. However, Cath urges people not to put them in just to bring biodiversity on the site, as there are much better ways including bat and bird boxes, planting and hedges. If you have an existing septic tank you will have to prove by 2020 that your system is working and being maintained properly. 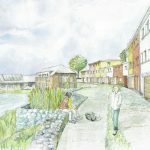 Right now, however, the Environment Agency is concentrating on new builds meeting regulations. Maintenance of septic tanks is relatively simple, as they contain no moving parts. Contractors take off the crust at the top, and remove sludge from the bottom. With a package sewage treatment plant, they still ‘de-sludge it’ but also check the pump is working properly. We're always on the look out for talented individuals to join our growing team. 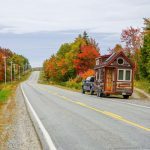 Perhaps you work in TV, radio or for a newspaper, but would love to be making content about eco homes. Or maybe you're already in the green building industry but want to turn your hand to teaching. Or perhaps you're a teacher who is just drawn to this area. Well, if you think you'd be a good fit for House Planning Help, please get in touch. 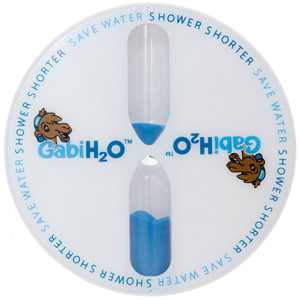 Cath Hassell from ech2o consultants shares why saving water – particularly hot water – is something we should all be doing. She also explains how we can achieve this in our houses through a mixture of technical solutions and behaviour change. Cath Hassell got into plumbing by chance but once she did she soon began to find it very interesting. After being given a book on composting toilets she then got into the environmental aspects of plumbing and has never looked back. All these types of water need to be addressed. So for water coming into the building, first it will be used in some way. Either we will drink it, cook with it, use it to flush the loo, use it to shower with or fill the bath with it. After that, the foul water will have to be removed from the house and dealt with in some respect. For the rainwater that falls onto our buildings it can be collected, stored and used or – as happens often in The West – it can be fed into a drain. Once rain has fallen it needs to be stored. That water then has to be cleaned and pumped into our buildings. Once we’ve used it, it has to be taken away and cleaned again before it can be put back into the environment. We must realise that tapped water comes at an environmental cost. Cath explains how originally settlements grew up around rivers before there was the ability to move water. A lot of water is also stored in naturally-occurring underground reservoirs (usually permeable rock) – known as aquifers – which are at varying depths. A hand dug well is an example of tapping into a shallow aquifer but many are hundreds of metres deep. When it rains some aquifers or groundwater get recharged, which is part of a yearly cycle. In other parts of the world that is not the case. The Sahara Desert, for example, does have water many metres beneath it but this fossilised water would not be recharged if it were extracted. So when we’re using water we must think of using it in a sustainable way. 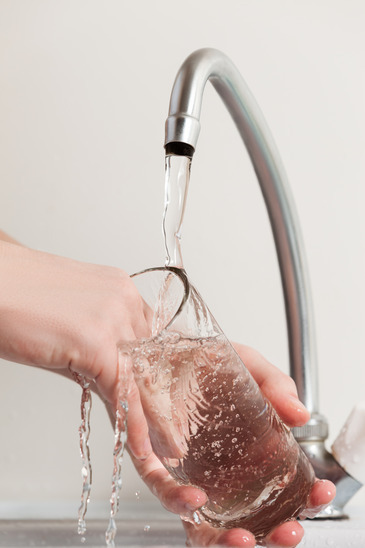 The water that is piped into houses in The West is potable water or drinkable water quality. Despite this fact we only drink about 1% of it! We might be cooking with another 1-3% of it. So the bulk of it is used for bathing or flushing the loo. In the 1960s the first W.C. ‘maximum flush volume' regulations were introduced (in the UK), allowing 15 litres. Through the years this has gradually been tightened and around the turn of the millennium it was reduced to a maximum flush volume of 6 litres. Now there are lots of toilets around that are duel flush so you can use 6 and 4 litre dual flush or even 4 and 2.5 litre duel flush. Most of the time we only have a wee and so we don’t actually need 6 litres to flush it away. These systems are much more efficient. The carbon footprint of cold water in the UK has been worked out at 1.2 kWh of electrical energy which translates into about 0.7kg of CO2 for every 1 m3. That takes into account the water coming into the house and then once it’s been used, the water being taken away and cleaned. As soon as water is heated the carbon footprint increases rapidly. Most of the time we’re using fossil fuels to heat water, which in turn is producing CO2 emissions. It is at this point that it becomes a global issue. It is estimated that 6% of the UK’s carbon footprint comes just from hot water we use in our homes! So there is an added benefit of saving hot water over cold water. Not All Technological Advances Have Been Good! While W.C. flush regulations have become more stringent in terms of saving water, some technological solutions have almost gone the other way. Cath says that historically the UK has had very poor quality showers with low flow rates but that's been changing. 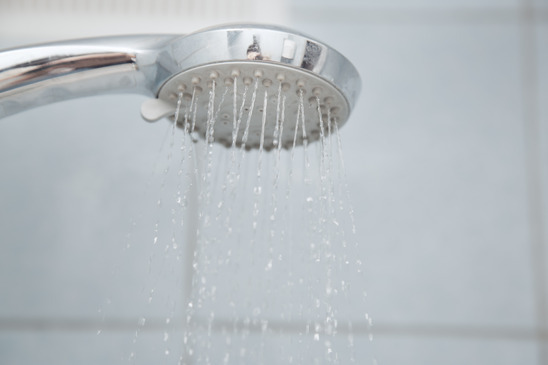 Having a combi boiler or a power shower means that flow rates have actually been going up. Technological solutions alone will not make significant strides in saving water: it must be combined with behaviour change. The key area we need to think about is taking a bath or having a shower. The average person in the UK uses 150 litres of water a day. A bath filled right to the top might be 160 litres of water and so would be using more than the average in one go. Depending on the flow rate of a shower, a 5-minute shower might use between 35 and 100 litres. That means a 20-minute power shower would use around 400 litres of water! 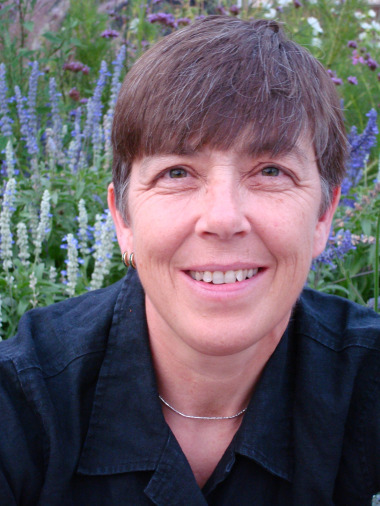 Cath stresses how shorter showers and shallower baths can make a massive difference. 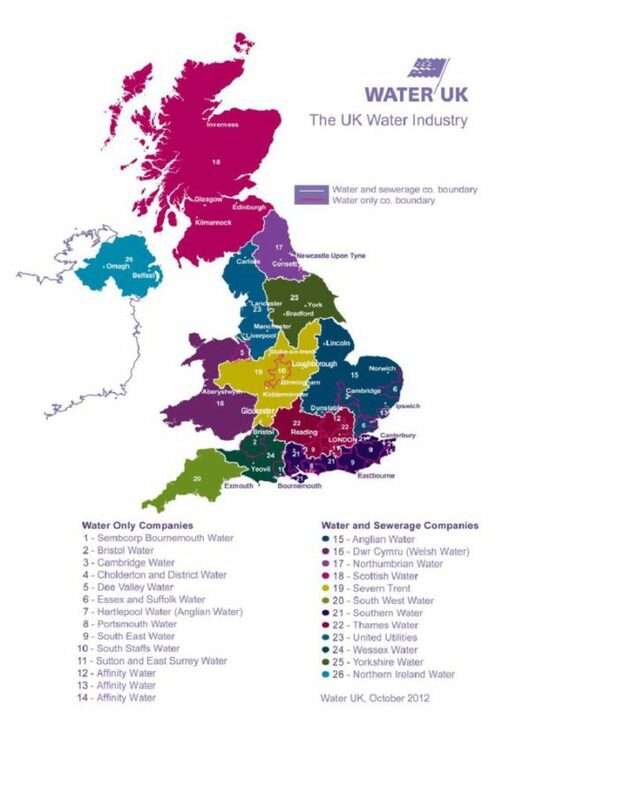 60% of people in the UK still pay a flat rate for their water, regardless of how much they use, but that is gradually changing. As more and more meters are installed people will have to pay for water per volumetric. Cath believes this would be much fairer and she also proposes that there could be a base rate allowance of 150 litres per day (ideally 130 litres a day) above which there would be a premium. This would not stop people from taking deep baths or watering their gardens but would mean they pay more for the privilege. There is not a universal price for water. Cath illustrates with a quick comparison. Those in the Thames Water area (London, Oxford, Reading, etc.) currently pay £2 per cubic metre of water as opposed to £5.50 per cubic metre of water for those that live in parts of the West Country (Cornwall, Devon, etc.). Flow Regulation Allows You to Set the Flow Rate of Taps, etc. When Ben suggests that flow regulation is about limiting water flow, Cath says that it's more about setting the rate at which water comes out. Using a flow regulator does not mean that taps just dribble! You won't even notice. It's about being intentional. While it is possible to collect rainwater and use it in our buildings (for flushing toilets, in washing machines, etc.) Cath believes it would be far better – and much simpler – to use it in our gardens (assuming you have one!). This is because one of the big problems in the UK, particularly in cities, is that there are combined drains. So the foul water sewage is mixed with the rainwater. When there's a lot of rain, the system cannot cope because there's too much to process at the sewage treatment plants, which means the overflow mechanism is channelling it into rivers or the sea! Keeping rainwater by our houses – by use of a rain garden – would make it possible for our sewage treatment plants to clean all waste water. A rain garden is an area that allows rain that might land on impervious surfaces the chance to be absorbed into the ground. It is planted out carefully to have maximum impact because on occasions it is going to be inundated with water. Either put in an unvented hot water cylinder or a combi boiler so that the mains water is coming in at high pressure. Then use flow regulation. In Cath's house her kitchen taps are set to 6 litres a minute and her wash basin taps to 4 litres a minutes, while the shower is 7.5 litres per minute. 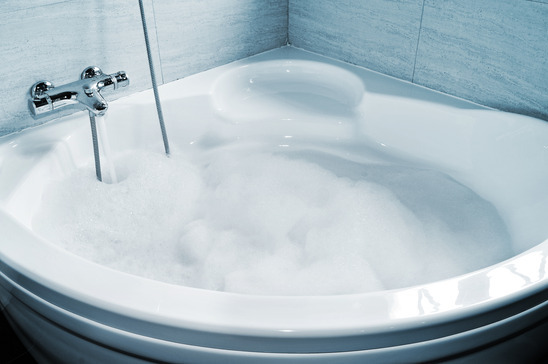 Stay with a standard sized bath because most people like to relax in a bath sometimes and it can defeat the point in a smaller bath. However, become more intentional about using it (as described above). If you’ve got a garden, collect as much rainwater as you can for use in the garden. Consider not connecting any of your rainwater downpipes into the drains. Use that water in your garden instead. Avoid laying down any impermeable surfaces (such as big areas of concrete). Look at using grey water – the water from showers and hand basins – in the garden at certain times of the year. Cath does this in the spring and the summer in her garden. They don't bring grey water back into the house though. Get a shower timer so that you can see how long you're spending in the shower! A lot of water companies give these away for free. 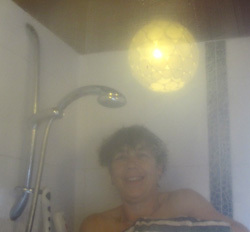 Check out Cath's blog on showering! As she travels around Cath is always taking notes. Perhaps she'll be coming to a shower near you! With possibly the strongest winds ever to make landfall, Typhoon Haiyan killed thousands when it struck the Philippines on 8th November. Is this typhoon an anomaly or a sign of the more fierce weather that will become the norm? Ben talks about seeing the devastation of a minor typhoon when he visited Legaspi in 2006. Are these areas going to be uninhabitable if extreme weather like this continues? If you haven't had a chance to donate, the Philippine Red Cross carries out some amazing work. How have you reduced the amount of water that you use?